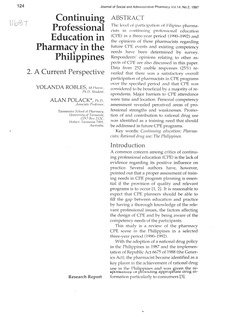 The level of participation of Filipino pharmacists in continuing professional education (CPE) in a three-year period (1990-1992) and the opinions of these pharmacists regarding future CPE events and existing competency needs have been determined by survey. Respondents' opinions relating to other aspects of CPE are also discussed in this paper. Data from 252 usable responses (25%) revealed that there was a satisfactory overall participation of pharmacists in CPE programs over the specified period and that CPE was considered to be beneficial by a majority of respondents. Major barriers to CPE attendance were time and location. Personal competency assessment revealed perceived areas of professional strengths and weaknesses. Promotion of and contribution to rational drug use was identified as a training need that should be addressed in future CPE programs.